In Part 1 we had a look at the basic components of a neuron and how these cells communicate. In Part 2 we considered an overview of the neurotransmitters involved in the communication process. Now we will look at how these neurons work together and form patterns that in turn correspond to our perceptions and experiences. A single neuron does not give us much information on its own: It is either firing or it’s not (think of the digital world where the basis of complex information is reduced to 1s and 0s). When a neuron is firing it has a certain rate and intensity and resulting neurotransmitter output. A single neuron by itself does not ‘perceive’ something on it’s own – perception is a group task in the world of neurons. That is not to say that individual neurons do not respond to specific input from our senses, because they do. But to make sense out of the flow of information coming from our sensory organs, our neural system is organised into a hierarchy of increasingly complex networks. I will summarise what the late Klaus Grawe describes as a hierarchical model of information processing, in his book Neuropsychotherapy: How the Neurosciences Inform Effective Psychotherapy, 2007, New York: Psychology Press. His description is based mostly on word done by neurophysiologists David Hubel and Torsten Wiesel in the 1960’s, who demonstrated that neurons can have specific activation patterns to specific stimuli. The hierarchy of our neural system is organised from sensory input to the perception of complex objects/understandings. For example, if you were looking at a woman sitting in a chair, there would be the ‘raw’ visual data streaming in from the sensory input of your retina. This information is recognised by neurons in a fragmented fashion whereby the individual elements of the chair, the woman, and the surroundings are processed by neurons specifically tuned to ‘recognise’ small, fragmented elements. These fragments are assembled by more complex neural patterns, by higher order cells, that recognise the assembly of the parts, the face, the arm, the body, the whole chair, and so on. At the top of the hierarchy are cells and networks in the cortex that recognise the whole picture: A woman sitting in a chair. The flow of this information is not a serial as you may suppose, but a complexity of parallel processing with feedback from various brain regions that is far too complex to illustrate as a simple serial arrangement. Nevertheless, the idea that our perceptions start as highly fragmented bits of information that are assembled into increasingly complex and sophisticated patterns of neural activation, holds true. There is no neuron that can recognise the complexities of a chair. Only the summation of complex networks with experience, recognise a chair for what it is. Having said that, there is also no single area of the brain that is involved in a specific mental function in isolation. Just as neurons do not perceive on their own, nor do specific regions of neurons activate without the activation and interaction of other regions. It is social connectedness to the extreme – connected to excite and to inhibit across trillions of individual synapses across multiple regions of the brain. An important feature of sensory networks in the brain is that of neural mapping. As sensory information is processed through increasingly complex stages, it is done in an orderly arrangement of neural clusters that reflect variations of importance. For example the part of the retina that has the greatest visual acuity is the fovea region. In the visual area of the cortex the region of neurons devoted to processing fovea input is greater in area than the area devoted to more peripheral visual information. In the same way the area in the cortex devoted to a highly sensitive areas like our lips is much larger than the area devoted to sensory input from the trunk. 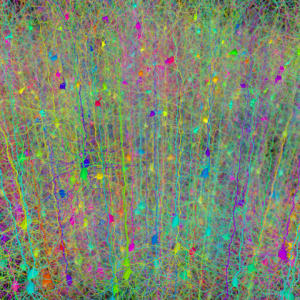 There are hundreds of such function specific neural maps and many of them can be illustrated topographically on the surface of the cortex. The brain is further organised into functional systems that, to some extent, can be identified by the physical architecture of the central nervous system. We will look at what these overarching systems are when we consider specific examples of pathology and applied neuropsychotherapy. We could learn the names and functions of a whole lot of regions at this point, but I think it’s going to be more engaging and memorable for us to consider specific regions and function in direct relation to specific problems clients come to therapy with. The point here is for us to understand that from a single sensory input neuron, we have increasingly complex hierarchies of neural networks that represent input features in specific areas of the cortex that form neural maps and these signals are processed within broad functional systems of organisation according to the physical architecture of the brain. Information from the external world, what we see, hear, feel, etc., are initially received by the visual, auditory, and somatosensory regions of our brain. This ‘raw’ data is fed into ‘convergence zones’ in the rhinal cortex (an area near the hippocampus that includes the enthorhinal cortex) that is part of the medial temporal lobe, for memory processing. The convergence zones take the raw data and starts to process the bits of information into a more holistic perception. Information flowing into the perirhinal cortex and the parahippocampal cortex, continues on into the enthorhinal cortex and then to the hippocampus. 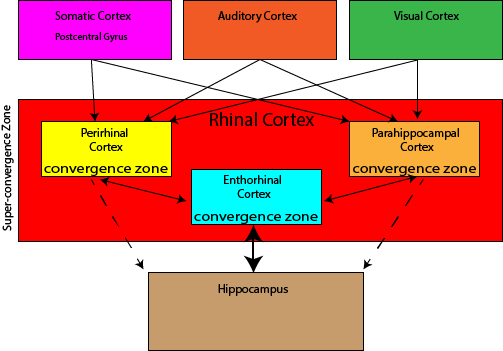 These separate areas are considered distinct convergence zones and taken together (the rhinal cortex) are a ‘superconvergence zone’. The diagram below illustrates the basic relationships within the rhinal cortex. The system is not, however, as simple as this. For example, the thalamus, a gatekeeper to the cerebral cortex, monitors information along these intermediate processing pathways, and prioritises what should be processed further and what should not depending on our motivations and goals. As you can appreciate, the increasing complexity and sophistication of perception flows from basic input sensors through systems of networks to an understanding we know as reality. Next time we will cut to the chase and look at extremely important areas of the brain for therapy: the Limbic System/Pre-frontal Cortex and their emotional role. Grawe, K. (2007). Neuropsychotherapy: How the Neurosciences Inform Effective Psychotherapy. New York: Psychology Press.